Jon McNaughton by clicking on the individual art links below. at the lowest possible prices guaranteed! 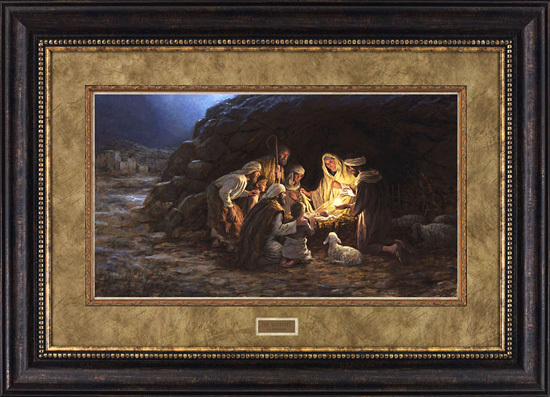 The Nativity and other artwork by artist Jon McNaughton can be viewed in our artist slideshow. The Nativity by artist Jon McNaughton and other John McNaughton art, art work, artwork, canvases, giclees, images, limited editions, open editions, paintings, paper, pictures, posters, and prints can all be found at Christ-Centered Art. I endeavored to paint The Nativity as I imagined it. The soft blue starlight lightens the landscape of Bethlehem while the shepherds gather reverently around the newborn King. What kind of wonder and awe were they feeling? I tried to instill in their faces the emotions I would have had, had I been there." Add $10 for shipping & handling. Add $12 for shipping & handling. This unframed limited edition paper print comes mint in its original folio, includes a genuine certificate of authenticity from McNaughton Fine Art, and is individually numbered and hand signed by the artist Jon McNaughton. Add $285.00 to frame this paper print. This unframed limited edition paper print can be purchased deluxely framed in a dark mat. This unframed limited edition canvas print comes mint in its original packaging, is stretched on wooden stretcher bars, has a genuine certificate of authenticity from McNaughton Fine Art, and is individually numbered and hand signed by the artist Jon McNaughton. Add $100.00 to frame this canvas. This unframed limited edition canvas print can be custom framed in any of our 16 individually priced select frames. Add $150.00 to frame this canvas. Add $195.00 to frame this canvas. 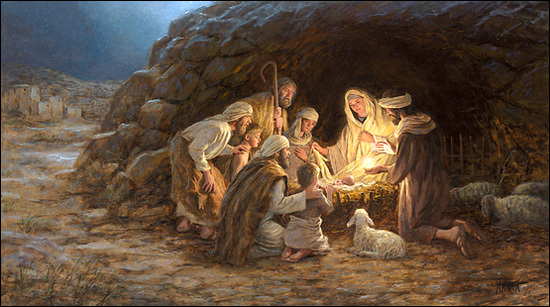 The Nativity by artist Jon McNaughton as well as other open and limited edition biblical paper art prints and canvases, giclees, images, lithographs, paintings, pictures, posters, and reproductions by renowned McNaughton Fine Art artist John McNaughton can be viewed and purchased at special sale prices at Christ-Centered Art.